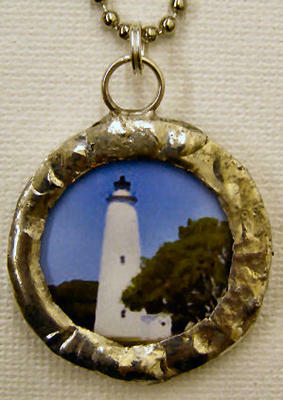 On the front, a full-bodied view of the Ocracoke Lighthouse in all its majesty. On the back, a branch of an amazing Live Oak against the Carolina Blue Sky. This piece can be worn either way. I sandwiched my photos between two 1.25 inch round pieces of glass, I then soldered them with lead-free silver solder. The jump ring and spring ring are sterling silver, and a 24" steel ball chain is included. Please view the next image for a photo of the back of this piece.